What Day Of The Week Was December 9, 1937? 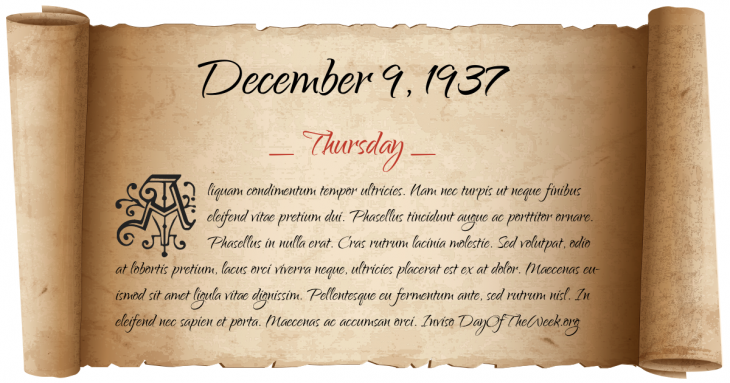 December 9, 1937 was the 343rd day of the year 1937 in the Gregorian calendar. There were 22 days remaining until the end of the year. The day of the week was Thursday. A person born on this day will be 81 years old today. If that same person saved a dollar every day starting at age 3, then by now that person has accumulated $28,621.00 today. Here’s the December 1937 calendar. You can also browse the full year monthly 1937 calendar. Second Sino-Japanese War: Battle of Nanjing – Japanese troops under the command of Lt. Gen. Asaka Yasuhiko launch an assault on the Chinese city of Nanjing. Who was born on December 9, 1937?